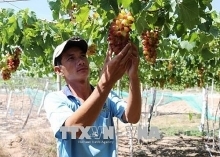 This year, litchi farmers in the Ha Dong area of Thanh Ha district, Hai Duong province have enjoyed a bumper crop in terms of both litchi price and output, with the income from litchi cultivation reaching a record high and doubling the previous crop’s value. From early days of June, the Provincial Road No. 390 section from the center of Thanh Ha district to the Ha Dong area (including Truong Thanh, Vinh Lap, Thanh Binh, Thanh Hong, Thanh Cuong and Hop Duc communes) has been crowded with people and vehicles, particularly at farm produce purchase locations, all in service of a bumper litchi crop. Le Thi Tho, the owner of a roadside litchi collecting location, said that she had been collecting litchi from farmers for over 20 days, with a daily input volume of between 12 and 25 tonnes. In the first ten days of the harvest, litchi was sold at VND45,000-50,000 per kilogramme, she said, adding that the price even rose to VND60,000 for high-quality produce. 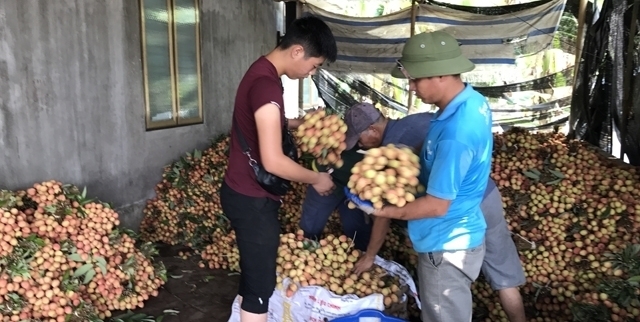 This year, Chinese traders have imported a large volume of Thanh Ha litchi, while domestic businesses have also joined hands to open purchase locations. The district has set a price floor of VND12,000 per kilogramme, which has created favourable conditions for enterprises and traders to operate and promoted healthy competition in litchi purchase, with no cases of private traders pushing for lower prices recorded. According to Pham Van Tuan, the owner of a transaction site, this season Thanh Ha litchi has ripened equally with sweeter taste and nicer appearances than ever before. All transactions have taken place quickly and conveniently, Tuan said, adding that the litchi price ranged between VND30,000-35,000 per kilogramme. All litchi products offered by growers have been purchased by traders. As confirmed by Vice Chairman of the Thanh Ha district People’s Committee Ngo Duc Vinh, the locality has approximately 4,000 hectares of litchi, so far 2017 has seen record-high revenues from the sale of litchi. There are about 1,300 hectares of early litchi, with productivity seeing a 40% increase compared to the previous season, at over 18,000 tonnes, 5,000 tonnes more than last year. Litchi prices have soared above and beyond expectations since the beginning of this year’s season, at between VND30,000 and VND60,000 per kilogramme. With the price of VND35,000 per kilogramme of early litchi on average, this year’s early litchi crop will generate a revenue of VND600-650 billion (US$26.4-28.6 million), doubling the figure of 2016’s early litchi harvest, Vinh said.